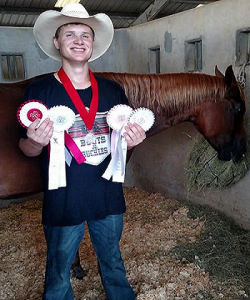 Jackson County 4-H’er Warren Loper is an award-winning member of the Boots and Buckles 4-H Horse Club. Warren is also hearing impaired. Earlier this year Warren won awards at the State and Regional 4-H Horse Shows. His mother Melissa Loper shared her thoughts with Jackson 4-H Agent Angel Granger regarding Warren’s 4-H experience and whether it has played a role in helping him build confidence in himself and succeed regardless of his hearing impairment. Warren was diagnosed as being completely deaf at two weeks of age. His loss of hearing is due to improper functioning of the hair follicles in the Cochlea of the ear. At 15 months of age, he received a Cochlear implant that was activated at 18 months of age. According to Melissa, Warren did not like the Cochlear implant at first because it allowed for all sounds to be heard at once. He had to learn how to drown out background sounds. The implant had to be turned down completely and then slowly raised to a level that was tolerable. His ability to handle the implant increased as he got older. Melissa says too that there are times when Warren would rather not be able to hear. We can’t blame him for that! One of the key components of 4-H is developing life skills and providing a safe and inclusive environment for all youth regardless of their physical or mental conditions. 4-H allows all youth the opportunity to explore their areas of interest. For Warren, the 4-H Horse Project allows him to learn the valuable life skills that come from raising and showing a horse and allows him to exhibit mastery of learned riding skills in competitive events. Youth involved in the 4-H Horse Project learn more than just the science behind feeding and caring for a horse, and how to properly ride. Youth also compete in contests such as Horse Bowl, Demonstrations, Public Speaking, and Art. Youth participating in these types of projects use their horse as a tool to increase their knowledge and enhance their life skills, making them more productive young people.